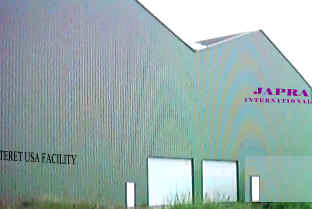 JAPRA Group International with its multinational Manufacturing and Distribution locations primarily in Steel Pipe and Tubes, Metal Studs, Malleable and Grey Iron Castings, Fence Products, Rollforming, Hot Dip Galvanizing and International Trading, is a well recognized and respected name in the Iron and Steel Industry. Our Mission at Japra Group is to identify Growth opportunities and provide innovative and optimal solutions to the related industries and maintain our respectable position in the fields of our operation. With its humble beginning in 1975 when our first manufacturing plant was setup, JAPRA Group International, today, represents itself as a multinational conglomerate of entities including manufacturing plants - Japra Steels (P) Ltd., ESSJAPRA Iron and Steel (P) Ltd., and Japra Steel Tubes. Our manufacturing capabilities include steel pipe and tubes that are high frequency electric resistance welded and are available as bare, black painted, pre-galvanized with re-metalized weld-bead and with hot dip galvanized coating; stainless steel pipe and tubes that are TIG, plasma and high frequency welded; steel studs and joists for the building industry; ferrous and non-ferrous foundries; extensive assortment of fence products; hot dip galvanizing and metal stamping to name a few.